This study sought to investigate the hourly and daily timescale responses of soil CO2 fluxes to temperature in a limed agricultural soil. Observations from different incubation experiments were compared with the results of a model combining biotic (heterotrophic respiration) and abiotic (carbonate weathering) components. Several samples were pre-incubated for 8–9 days at three temperatures (5, 15 and 25 °C) and then submitted to short-term temperature (STT) cycles (where the temperature was increased from 5 to 35 °C in 10 °C stages, with each stage being 3 h long). During the temperature cycles (hourly timescale), the soil CO2 fluxes increased significantly with temperature under all pre-incubation temperature (PIT) treatments. A hysteresis effect and negative fluxes during cooling phases were also systematically observed. At a given hourly timescale temperature, there was a negative relationship of the CO2 fluxes with the PIT. 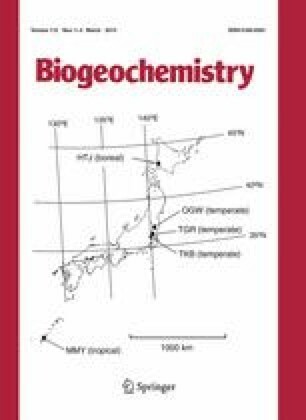 Using the combined model allowed the experimental results to be clearly described, including the negative fluxes and the hysteresis effect, showing the potentially large contribution of abiotic fluxes to total fluxes in limed soils, after STT changes. The fairly good agreement between the measured and simulated flux results also suggested that the biotic flux temperature sensitivity was probably unaffected by timescale (hourly or daily) or PIT. The negative relationship of the CO2 fluxes with the PIT probably derived from very labile soil carbon depletion, as shown in the simulations. This was not, however, confirmed by soil carbon measurements, which leaves open the possibility of adaptation within the microbial community. The online version of this article (doi: 10.1007/s10533-012-9739-7) contains supplementary material, which is available to authorized users. Pauline Buysse holds a Research Fellow Grant from the FRS-FNRS, Belgium. The authors thank Dr Gilles Colinet for the soil pH measurements, Marie-Christine Requier for her technical support during the soil C analyses, Eléonore Horge for helping with the soil CO2 flux measurements, and Martin Maier and Marilyn Roland for helping to improve our understanding of the abiotic processes. The authors also thank the two anonymous reviewers for providing the thoughtful comments that helped improve the manuscript.